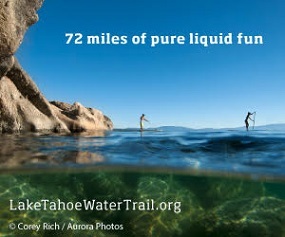 Thank you Tahoe Keepers! Keeping it Blue, yeah! During the 2017 boating season Tahoe Resource Conservation District (Tahoe RCD) watercraft inspectors performed more than 7,000 new inspections. In total, more than 14,000 vessels launched at Lake Tahoe, including both newly inspected vessels and those with intact Tahoe-issued inspection seals. Local agencies are critically concerned as more Western waterbodies have shown evidence of invasive mussels and other aquatic invaders. This summer, Nevada Department of Wildlife confirmed establishment of New Zealand mudsnails in sections of the Truckee River from Mayberry Park in Reno to the Sparks area. As watercraft continue to arrive from high-risk waters, the importance of Lake Tahoe’s Watercraft Inspection Program remains critical. In fact, 36 of the inspected watercraft were harboring aquatic invasive critters including plants, mussels and snails. With our efficient roadside inspection stations, Tahoe RCD decontaminated 4,221watercraft with hot water preventing invasive species from entering Tahoe’s waters. “I’d like to thank the more than 3,000 boaters who arrived at the Tahoe inspection stations with their watercraft clean, drained and dry. They got on the water faster because decontaminations mean more time and more cost for both the boaters and the inspection program.” Nicole Cartwright, Watercraft Inspection Program Administrator. Tahoe RCD watercraft inspectors also staffed Boca, Prosser and Stampede Reservoirs and partnered with the Truckee Donner Recreation and Park District to provide watercraft inspectors at Donner Lake. Truckee inspectors screened more than 3,500 vessels for aquatic invasive species. Tahoe RCD continues to support jurisdictions in the Truckee region as they work toward development of their 2014 aquatic invasive species prevention programs. Prevention efforts for over 7000 paddlers occurred at U.S. Forest Service kiosks, boat ramps and Fallen Leaf Lake. They were assessed for their risk of transporting aquatic invasive species from previously visited waterbodies. Paddlers were also educated about self-inspecting and decontaminating canoes, kayaks and paddleboards and encouraged to become a Tahoe Keeper (TahoeKeepers.org). Current information on the boat inspection program, including hours of operation for boat launches and snow closures, is available at TahoeBoatInspections.com or by calling 888-824-6267. The Watercraft Inspection Program is part of the Lake Tahoe Aquatic Invasive Species Coordination Committee which is implemented by 40 public and private partner organizations including federal, state and local jurisdictions, research partners, public utility districts, and private marinas, with major funding from the US Fish & Wildlife Service. The state, federal and local agencies comprising the Lake Tahoe Aquatic Invasive Species Coordinating Committee have provided leadership, direction and resources to fulfill this program’s mission of prevention, detection and control of aquatic invasive species in the Lake Tahoe Region. The Tahoe Resource Conservation District’s (Tahoe RCD) mission is to promote the conservation and improvement of the Lake Tahoe Basin’s soil, water and related natural resources by providing leadership, information, programs, and technical assistance to all land managers, owners, organizations, and residents. The Tahoe RCD is a non-regulatory, grant funded, public agency that works with a variety of partner agencies to implement projects, programs and outreach which currently focus on erosion control, runoff infiltration, terrestrial and aquatic invasive species control, and conservation landscaping.